Senna alata, the candle bush, is an important medicinal tree, as well as an ornamental flowering plants in the subfamily Caesalpinioideae. It also known as a candelabra bush, empress candle plant, ringworm tree, or candletree. A remarkable species of Senna, it was sometimes separated in its own genus, Herpetica. S. alata is native to Mexico, and can be found in diverse habitats. In the tropics, it grows up to an altitude of 1,200 m. It is an invasive species in Austronesia. In Sri Lanka, it is used as an ingredient in Sinhala traditional medicine. The shrub stands 3–4 m tall, with leaves 50–80 cm long. The inflorescence looks like a yellow candle. The fruit, shaped like a straight pod, is up to 25 cm long. Its seed are distributed by water or animals. The leaves close in the dark. Senna alata is known as Christmas candle because it has yellow flower spikes on its evergreen shrubbery that look like thick, waxy candlesticks. The plant is an easy-to-grow perennial that thrives in U.S. Department of Agriculture plant hardiness zones 10 through 11. It also grows as an annual in zones 8 and 9. Simple propagation techniques will produce healthy specimens that provide a lovely floral display for your home garden and will also attract butterflies. Senna alata is from the bean family and originally found in tropical regions of Africa, Southeast Asia, the Pacific Islands and America. It can reach a height of up to 30 feet in its native habitat, although 5 to 8 feet is more typical in a backyard garden, with a spread approximately half that width. An aggressive grower, especially in areas with a high water table, Senna alata often forms thickets through natural propagation. For this reason, the shrub is a good choice for borders. As a specimen plant, it could also be grown in outdoor containers or tubs. You may propagate the plant by growing seeds, which may be sold under the plant's various alternate names including candle bush, candlestick tree, candelabra bush, Christmas candle, Empress candle, golden candlestick, popcorn senna and ringworm tree. If you have access to Senna alata plants, collect seeds from the six-inch long seed pods, which can contain as many as 60 seeds each. On their own, senna alata pods and seeds can be distributed by water or animals, or the plant will sucker from roots. If you're collecting your own seeds, harvest pods in the fall and store them in a dry location over the winter. Pop open the pods in the spring and start cultivating seeds indoors from February through March, or several weeks before the last average frost date, to give the seedlings a head start. For best results, first soak seeds in warm water overnight before planting. Because they're fast growers, seedlings usually bloom the first year from seed. Plant seeds about three quarters of an inch deep in a well-drained soil and humus mixture with a pH range of 5.5 to 6.5. Find an area with full sun for the seedlings' permanent home and feed with a balanced fertilizer after planting and then once a month during the growing season. Senna alata plants are drought-tolerant, but they will still benefit from being watered regularly and given a layer of mulch during the hottest summer months. As young plants develop, pinch new growth to increase the number of future flower spikes, and prune mature plants back in spring to improve flowering. All parts of the Senna alata plant are poisonous if swallowed and should be kept away from children or pets. Because this shrub can become invasive under certain conditions, some areas have banned the introduction of the plant or seeds into the region. This is less of a problem in the U.S. than in other places, such as some areas of Australia. 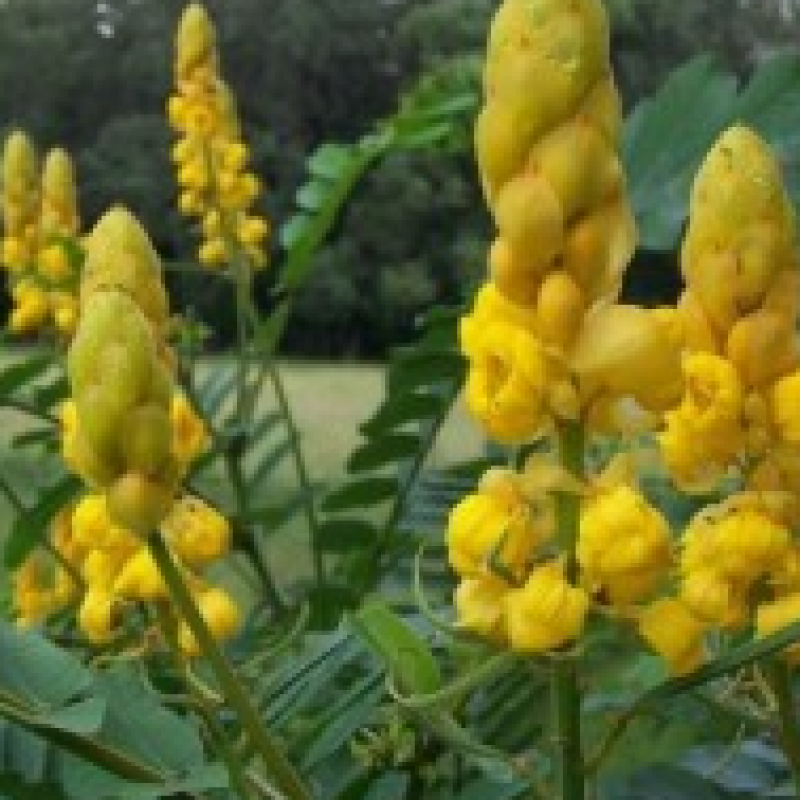 Use caution when adding Senna alata to your garden and keep any eye on where it goes to prevent its invasion into natural habitats.